The recent run of warm weather here in the UK has been a reminder of how hot it was when I visited Cyprus in April. This little chap was one of the first insects I encountered in the village of Frenaros where my mum and dad now live. My reason for showing it here is that this strikingly coloured red and black bug, that looks as though it has an african mask painted on its back, may be spreading northwards into England. Recently it has been found in Devon. Previously there have been small colonies in Surrey and Sussex and sporadic reports elsewhere. Although Britain has traditionally marked the northernmost edge of its range it has been a native of Jersey and Guernsey in the Channel Islands for some time now. In the last decade the populations there have increased greatly. So it may be an insect worth looking out for in future. It proved a particularly difficult subject to photograph. Being almost manically active due to the very warm temperature. It wouldn’t keep still, even for a fraction of a second, and so the vast majority of my photos were just slightly blurred. But I persevered over several days and eventually succeeded in getting this image. The Fire Bug Pyrrhocoris apterus is often found in large groups, especially in its immature nymphal forms. In Cyprus I found them in large quantities, at all stages of instar, hiding at the bottom of mallow. 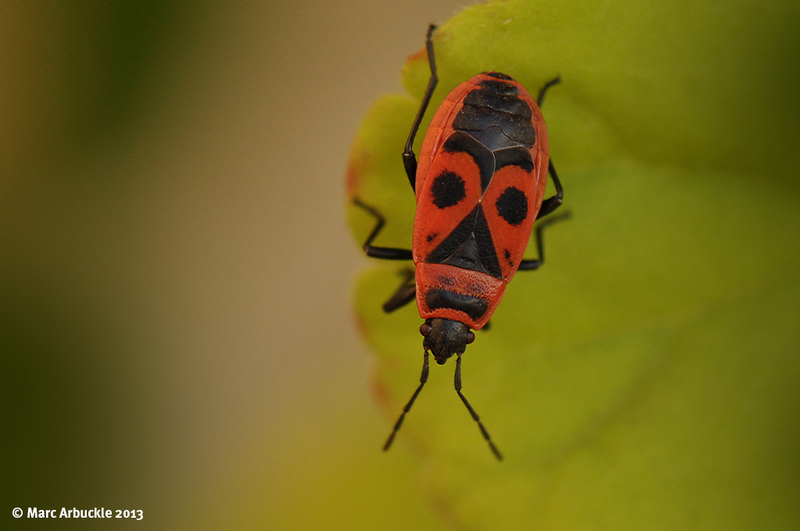 It is a true bug, belonging to the family Hemiptera. True bugs are distinguishable from the beetles, Coleoptera, by having sucking mouth parts and babies that hatch from the egg somewhat resembling the adult. This is called incomplete metamorphism as it only has 3 stages, egg, nymph and adult. The little bugs shed their skin several times as they grow, developing wings at the last stage when they become sexually mature. These interim stages are called instars and typically there can be 4 or 5. In comparison, the beetles Coleoptera, have biting mouthparts and undertake a complete metamorphism which has 4 stages, egg, larva, pupa and adult. With apologies to Robby Krieger and The Doors for the title of this post, taken from their 1967 single Light My Fire. Thank you Kelly. It is a stunning looking insect. Really enjoyed your site by the way. You’ve got some really interesting stuff on there. We have lots of these here in southern France. The locals call them gendarmes because you often see them in pairs – especially in the mating season of course!